This entry was posted on October 16, 2009 at 9:15 am and is filed under Barack Obama, Conservative Issues, philosophy, Politics, socialism. You can follow any responses to this entry through the RSS 2.0 feed. You can skip to the end and leave a response. Pinging is currently not allowed. You seem to be seizing on soundbites and reacting to them, rather than appreciating the larger context, and there is no indication of any political or philosophical objectivity in the entry above. Perhaps you were aiming for invective (which you’ve succeeded in). This sentiment roughly compares to the comments attributed to Mao about losses in war. Linguistically, this is phrased in Enlightenment verbiage, while Mao’s is a more recent vernacular, but hopefully you can understand the connection. Let me now take a more comprehensive view, and warn you in the most solemn manner against the baneful effects of the Spirit of Party generally…. A fire not to be quenched, it demands a uniform vigilance to prevent its bursting into a flame, lest, instead of warming, it should consume. He admits in his writings that he signed legislation while in office that his principles were at odds with. Washington himself had the wisdom to know that there are many things our imperfect union can learn, and that no perspective is invalidated simply because one might not agree with it (in whole or in part). Frankly, simply because one finds ideas or inspiration from Machiavelli does not make one a tyrant. And the fact that there are alternative currents of political thought within our country is a good thing – it means that our nation is working exactly as it was designed to. I find it funny that statists are trying to defend the appointment of a radical that openly holds up the greatest mass murderer in human history as the “political philosopher” she admires most. To be so blinded by an infantile egalitarian sentimentality as to ignore genocide is to be a truly deluded and parasitic person. Look in the mirror, people? What made you into irrational parasites? What kind of self-loathing must you have to surrender to the pablum which is based only in kindergarten concepts of fairness, bitter envy, and/or a desire to extort from better competitors instead of do the work to compete better yourself? Do us a favor and either get in the game and compete instead of bribing the scorekeeper…either that or just kill yourself and stop parasiting off of others. You give me more soundbites: one of them being, “You’re actually comparing Thomas Jefferson and George Washington to Mao Tse-Tung? Pardon me, but you pretty much have to be a communist yourself to even CONSIDER such a comparison as being valid. Jefferson’s statement is quite clear to anyone who would understand: human nature is such that tyrants will constantly rise, and those who love freedom will constantly have to be prepared to fight them. The difference between Jefferson and Mao is the difference between he who warned us we would have to fight tyrants, VERSUS A DAMNED TYRANT. Further, Mao didn’t just sustain “losses in war.” Mao murdered 70 million of his own people during peacetime. And he proudly claimed that he would murder 300 million to advance his power and agenda. Not very Jeffersonian of him, I might add. As a second “further,” Mao wasn’t merely a Machiavelli; he was a murderer of more human beings than Hitler. Sorry, but your view that one can derive one’s political philosophy from a mass-murdering communist monster – without such allegiance in any way detracting from one – is beyond frightening. Allow me to offer the analogy of fruit as political ideology: you seem to have the bizarre notion that rotten, maggot-ridden fruit is just as tasty and as wholesome as ripe fruit. You embrace a relativistic pragmatism that can think anything and do anything. Just like Mao himself, I hasten to add. If anyone wants to know how this country was supposed to work, please let them read the Founding Fathers, rather than Chairman Mao. PLEASE. Well said, wulfmankarl. Sic semper tyrannis. The attitude we need to embrace is, “Better to starve free than be a fat slave.” But instead, we are looking to the greatest slavemasters in human history for guidance. Something is incredibly wrong here. Interesting. I obviously don’t fear such things as much as you. Is it truly your perception that your fellow countrymen elected a Communist as our President? Can you offer me the argument that such a view is foolish, in line of the facts I presented in the article, and other facts and statements I could very quickly bring to bear? Can you show me, and please be specific, why Barack Obama – who was mentored by communists, who “very carefully” chose Marxist professors, who chose to attend a radical Marxist church, who has actually picked an array of communists to serve his agenda, who has on several occasions I can document talked about “redistribution of wealth,” “social justice,” “economic justice,” etc. – is not a communist? Obama said that we could know who he was by who he surrounded himself with. I’m interested in hearing how these are things that a CAPITALIST, but not a communist, would do. Obama socialized the auto industry. He went after the banks and socialized them (yes, Bush did it when confronted with a crisis; but Obama took that ball and ran down the endzone with it). He is now attempting to pass sweeping laws to undermine free market capitalism with never before seen regulations of Wall Street. He is trying to nationalize nearly a fifth of the US economy with health care – having publicly stated that he wanted a single payer, socialized system. He is trying to socialize our energy system, with a cap-and-trade scheme that the Congressional Budget Office has said would cost jobs and reduce our GDP. And Obama publicly stated that his cap-and-trade would necessarily cause energy prices to skyrocket. So you go ahead and make the case that only a fool would call Barack Obama a communist. Labels of Communist/Socialist/Fascist/Libertarian/Royalist…. who cares. The fact is that the ‘Communist’ is having to work within the confines of a constitutional republic. I’d say that if an elected representative is working within the boundaries of such a system, he is necessarily a constitutional republican, regardless of the predilections of his detractors (or admirers, for that matter). Appealing to a label seems like Small Politics to me. Believing that Obama is a Communist, and knowing that the majority of Americans CHOSE him to lead us… how do you label the majority of your countrymen? First of all, I point out that you did not take me up on my challenge to show how it would be unreasonable to consider Obama as a communist. So I consider that point made. I would submit to you that “labels” go to the essence of language itself. It is impossible to communicate – or even think – without them. It astonishes me that you would so lightly and cavalierly toss out the very grounds for something so essential. I mean, my God, if nobody should care about labels, we might as well place the freakin’ world under the leadership of the next Hitler. After all, “Nazi” is just another label to go with the others you mention. It is one thing to use “labels” in a purely rhetorical, false, demagogic manner. It is quite another to use them accurately. A mountain of evidence is beginning to build that I am using my “label” very accurately indeed. There are a lot of people – including a great many journalists and even LIBERALS – who would argue that Barack Obama did not represent himself as a communist, or a radical, or even a leftist. Rather, they would say, he portrayed himself as a moderate. He said he would end the politics-as-usual partisanship; he would heal the divides. But he dishonestly represented himself. Note the title of the ABC article on the subject: “Spread the wealth?” THAT wasn’t how Obama had campaigned. 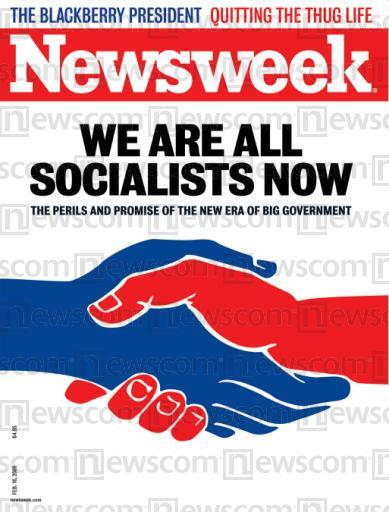 What followed in the media was a huge campaign: Obama is NOT a socialist. There was a huge movement to deny Obama was any kind of a socialist. They literally argued that to call Obama a socialist was RACIST. Americans were not allowed to even THINK of Obama as a socialist. As part of Obama’s socialist agenda, he has created deficits that are as unsustainable as they are staggering: more than $1.4 TRILLION. In fact, Obama has now accumulated more deficit/debt than George Bush – whom Obama attacked for his reckless spending during the campaign – accumulated in his entire 8 years in office – COMBINED. And as it stands, right now, only 43% of Americans would vote to re-elect him. That is a stark account of the fact that the American people do not want the Obama that Obama is now revealing himself to be. Now, if you think that it is okay to completely misrepresent yourself just to get power, promise one thing, do another in office, then I submit that you are a completely dishonest human being. There is no point arguing with you. You simply must be defeated. Because you would lack the character, the decency, the virtue to sustain a fair and valid argument. You won’t acknowledge facts, you won’t admit when you’re wrong, you will tell lies and pass them off as the truth, etc. And again, such “logic” would welcome back the next Hitler. Represent yourself one way; get power; become a monster. Hopefully you’re not that kind of a person. If you aren’t, then let us acknowledge that a) Obama misrepresented himself to the American people; and b) it is immoral to do such a thing. Jefferson: “If we can prevent the government from wasting the labors of the people, under the pretense of taking care of them, they must become happy” [Bergh, Writings of Thomas Jefferson, 10:342]. They warned against confiscatory taxation and deficit spending. Jefferson said it was immoral for one generation to pass on the result of its extravagance in the form of debts to the next generation. He wrote: “… we shall all consider ourselves unauthorized to saddle posterity with our debts, and morally bound to pay them ourselves; and consequently within what may be deemed the period of a generation, or the life [expectancy] of the majority” [Ibid., 13:358]. Samuel Adams: “The Utopian schemes of leveling [re-distribution of the wealth] and a community of goods [central ownership of all the means of production and distrubution], are as visionary and impractical as those which vest all property in the Crown. [These ideas] are arbitrary, despotic, and, in our government, unconstitutional” [William V. Wells, The Life and Public Services of Samual Adams, 3 vols. (Boston: Little, Brown and Company, 1865), 1:154]. I haven’t argued your belief that Obama is a Communist precisely because I don’t see the point. We are simply not going to agree, and for every fact you muster to support your view, I could counter it with one of my own. My comment on labels wasn’t that they’re useless in general. They are useless when used in a context for which they cannot apply. Our constitutional republic WILL NOT ALLOW us to be run as a Communist state, nor a fascist one, etc. The mechanisms that the FFs built our system around were designed to prevent tyranny. It makes sense to see past a label when it’s a pointless one. Personally, I’m sure Bush would have loved to found an Imperium – but he couldn’t. The system self-corrects. There is a preponderance of an irrational fear of ‘socialism’ in the US (even though we’ve had several socialistic elements in our society for decades, most of which conservatives have helped legislate). I find it interesting how most conservatives I hear (over the last near-year) keep working themselves up and claiming that a revolution is coming. My thinking is that the revolution is already underway; they just don’t like the side they’re on. There. I congratulate myself, for I have just easily defeated you. Don’t tell me what you COULD do. I can tell you that I could fly if I flapped my arms hard enough. Either put up, or shut up. As it is, I offered the case for Obama’s communism that you didn’t in any way touch. Telling me what you COULD do is pretty meaningless. It’s interesting that you believe that there is no way we could ever have a fascist state. Having read Jonah Goldberg’s Liberal Fascism, I learned that we’ve already HAD such a state. In particular, read up on all the things that Woodrow Wilson did during his administration. I have been reading two books, “Liberal Fascism” by Jonah Goldberg, and “New Deal or Raw Deal,” by Burton Folsom. Both books are exquisitely footnoted with primary sources. And it is utterly amazing how incredibly fascistic the New Deal was. Alexander Sachs, a leading economist – who had grown up in Europe and seen fascism firsthand – was invited to consult on the formulation of the NRA (National Recovery Administration). He later became part of the administration. He warned that such an entity as the NRA could only be administered “by a bureaucracy operating by fiat and such bureaucracy would be far more akin to the incipient Fascist or Nazi state than to a liberal republic.” When “Brain Truster” Rexford Tugwell visited Italy in 1934 he found the Fascist project comfortingly familiar: “I find Italy doing many of the things which seem to be necessary… Mussolini certainly has the same people opposed to him as FDR has. But he has the press controlled so that they cannot scream lies at him daily.” And when the Research and Planning Division of the NRA commissioned a study entitled, “Capitalism and Labor Under Fascism,” it concluded: “The fascist principles are very similar to those which have been evolving in America and so are of particular interest at this time.” There are OVERWHELMING similarities between the New Deal and fascism. We have had emergencies before. And our leaders have used emergencies to erect fascistic states. Furthermore, you yourself cited Jefferson’s “tree of liberty” quote. Jefferson was saying that the very tyranny that you claim is so impossible was ALL TOO possible – and we needed to watch for it and fight and even die to prevent against it. The fact of the matter is, that the very things Jefferson most warned us about have HAPPENED. Our constitutional republic might have protected us had we actually bothered to FOLLOW the Constitution. But we have done no such thing. I have to truly laugh at you when you utter your comment, “Personally, I’m sure Bush would have loved to found an Imperium – but he couldn’t. The system self-corrects.” First of all, the system was breaking down before Bush showed up. And second, Barack Obama has pursued EVERY SINGLE POLICY that Bush pursued that was so awful and so denounced while Bush was in office. Obama has continued domestic eavesdropping; he has continued to hold prisoners without trial; he has continued the practice of rendition. And so on. What makes me truly sick about liberals is the two-faced galling hypocrisy of demonizing Bush for his practices, and then forgetting all about the same practices as Obama continues them. There have been a FEW decent liberals – but way, WAY too few. I invite you to explain how conservatives were the ones who legislated socialism. I actually think you could cite a couple instances (Bush’s own Prescription benefit – Part D of Medicare would be one example) where Republicans in fact DID support socialist policies. But all the big ones were BIG TIME Democrat efforts. Famed journalist Edward R. Murrow said, “A nation of sheep will beget a government of wolves.” And we are one ignorant and apathetic nation of sheep these days. As to your last sentence, I completely agree. Time will tell. Either adding so massively to our debt/deficit that it is unreal will be a great thing, or it will be a terrible one, for instance. We’ll see. Anita Dunn is a dangerous fool, and comments like those of Etre reflect those of trolls who have been representing, defending, and promoting Obama since he first ran for President. They seek out and infiltrate conservative sites and blogs with their naive propaganda. Sooner, or later, their ridiculous attempts at indoctrination, and efforts to silence dissent, will collide with reality, and even their mindless followers will realize that when you insist on eating the goose that lays the golden eggs, it might fulfill your immediate hunger, but will prove to be a foolish solution that can only lead to the eventual starvation for everyone! The words “dangerous fool” now describe most of those who rule over us. Boy are you ever right about liberal trolls. They drive by and throw some crap. Rarely do I ever get the sense they read the article they’re posting to beyond the title. In not dealing with the facts/sources/arguments I provide, they demonstrate themselves to be despisers of truth. I’d be ashamed to do what they do – and have never done it. Liberals are fools by virtue of their depraved and flawed worldview. They view the world through a kaleidoscope, through their Marxist and secular humanist theories. And no matter how many times their ideas have been disproven, they rabidly continue to cling to them. Most liberals in politics go in and out of government from academia to think tanks to government to international bodies. They have never run an actual business in their lives. Ultimately, the reason they want to kill the golden goose is because all they really want is total power of the lives of everyone. They want their big government system to rule over conservatives, and religious people, and independents, and everyone who disagrees with their agenda. With the golden goose dead, there will be nowhere else to turn but government. traitors dismantle our Constitution, and our First Amendment!!! These people are true believers in a political and economic system that our founding fathers utterly despised. I truly believe they are playing on the “Cloward-Piven” strategy, deliberately attempting to so undermine “the system” that it comes crashing down – under the idea that they will be able to create their next failed “utopia” in its place. And they might be right. If these people crash our economy, what beside government will be left to pick up the pieces? They think they can crash the system and then take advantage of the disaster they created. And then the next Mao – who murdered 70 million of his own people – will be free to rise from the ashes and create the new Marxist/liberal state that the left has been dreaming about for decades.